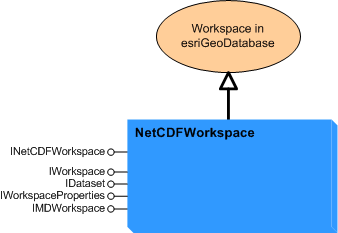 The DataSourcesNetCDF library contains objects used for accessing netCDF files and for creating rasters, features, and tables from netCDF variables in ArcGIS. 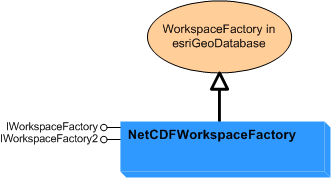 To work with a netCDF file, you need to create a workspace factory using the NetCDFWorkspaceFactory class. After creating a NetCDFWorkspaceFactory object instance, use the OpenFromFile method to get a NetCDFWorkspace object to work with the data. You can also create a WorkspaceName and set its WorkspaceFactoryProgID and PathName to a netCDF file. NetCDFFeatureClassName extends DatasetName. You can get a NetCDFFeatureClass instance by calling the Open method on any NetCDFFeatureClassName instance. You can use the properties of the IMDFeatureClassView interface to specify the parameters required to create a netCDF feature class from a netCDF file. The NetCDFTableName object extends DatasetName. You can get a NetCDFTable instance by calling the Open method on any NetCDFTableName instance. You can use the properties of the IMDTableView interface to specify the parameters required to create a netCDF table view from a netCDF file. NetCDFRasterDatasetName extends DatasetName. You can get a NetCDFRasterDataset instance by calling the Open method on any NetCDFRasterName instance. You can use the properties of the IMDRasterDatasetView interface to specify the parameters required to create a netCDF raster dataset from a netCDF file.